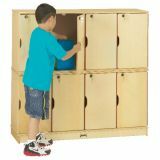 Four-section lockers are stackable, up to three high. Different locks and keys included for secured storage. Minimal assembly to stack, hardware included. 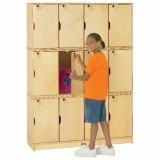 Individual lockers are 10 1⁄2"W x 12 1⁄2"D x 20"H. Stacked lockers must be fastened to a wall. 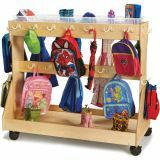 Each unit is 48 1⁄2"W x 15"D x 67"H. Weight 222 lbs. Lifetime warranty.